With Vienna being the residential city to the Habsburg Emperors of the Holy Roman Empire with their close ties to the Roman Catholic church, Vienna attracted many orders that built monasteries and churches . 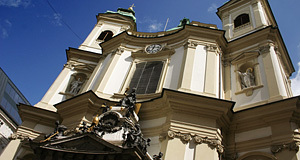 Combined with the many parish churches of the city, dozens and dozens of churches in different styles reflect the Catholic roots of Austrian culture even today. In the following, you find a list of churches in Vienna that is arranged by district (Bezirk). This list is a combination of several church directories that I have found online; unfortunately, it is incomplete and I am not happy with it. Until I find a more complete record, though, I hope you find the following list at least somewhat useful. Wikipedia Category "Churches in Vienna"